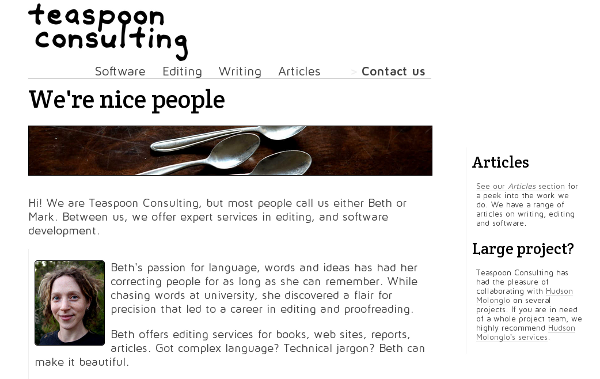 My friend Beth offers editing services for books, web sites, reports, articles. Buying a house is, on the whole, overwhelming. There are a lot of intermediaries involved--lenders, solicitors, insurers, real estate agents--and it feels like everyone is only giving you a small glimpse of the whole process. That's probably not surprising: to them, it's an everyday, boring process; to you, it's something that only happens a few times in your life. I'm writing this to attempt to summarise the process I went through when buying a house. I bought a house in Canberra (the capital of Australia) in 2010, so my comments reflect the state of things in that place at that time. I should also emphasise that buying a house is my only claim to expertise, and not a very good claim either. Please take what I say with a grain of salt, as it's the ravings of a rank amateur. Any errors are mine (but I'd appreciate corrections!). Conveyancing: the legal process of transferring ownership of property from one party to another. Deposit: the amount (usually 10% of the purchase price) that you pay the seller when exchanging contracts. Exchange of contracts: the date at which you and the seller enter into a contract for the sale of the property. The contract will contain lots of conditions, but the crux of it is you agree to give them money and they agree to give you the property. Gazumping: if another buyer makes a higher offer between the time you make yours and the time contracts are exchanged, the seller may accept their offer and you lose the house--you have been gazumped. A potential issue in ACT and NSW where the time lag between offer and contract exchange can be many days. Mortgage insurance: a discretionary fee that your lender might charge you. Private treaty: a buying arrangement in which the seller sets the price of the house in advance. Sort of the opposite of an auction. Settlement: the date at which you take legal ownership of the property (roughly speaking). Stamp duty: a tax aimed at people who buy property. Decide how much you can afford to spend based on mortgage repayments and your savings. Find a lender and get a letter of pre-approval for finance. They'll want a whole bunch of information from you: evidence of savings, information about your salary, information about any assets or liabilities you have, etc..
Find a solicitor who is willing to provide conveyancing services for you. Find a house you like. Harder than it sounds. At the open house/inspection, ask the seller (or their agent) for a copy of the contract for sale. This will include a draft of the contract, a property inspection report, land title information, and so on. If the property is being sold by private sale ("private treaty"), you can make your offer right away. If your offer is accepted, you arrange for contracts to be exchanged. In the ACT (and NSW), the time between making your offer and exchanging contracts can be a number of days--one or two weeks isn't unusual. This period is a mixed blessing. On one hand, it gives you some time to carry out the remaining steps leading up to the exchange of contracts: getting building insurance, having your solicitor review the contract for sale, and so on. However, it's important to realise that the property isn't yours until contracts are exchanged. That means the seller is within their rights to sell the property to someone else if they get a better offer. That's known as being gazumped, and there's not much you can do except arrange to get the contracts exchanged as quickly as possible and hope it doesn't happen. If the property is being sold at auction, you need to carry out the steps in this section in advance of the auction day. If your offer is accepted at auction, you'll have to exchange contracts, sign, and pay your 10% deposit on the day of the auction. While that at least means you can't be gazumped, you need to be very prepared. Visit your bank and get a bank cheque (or transfer money) for the full amount of the deposit (10% of the purchase price). This will be held in trust by the agent when the contracts are exchanged, then given to the seller at the time of settlement, along with the net balance of the purchase price. Arrange for building insurance on the property, starting from the date you expect to exchange contracts (not the date you expect to settle). In the ACT, you're liable for the property as soon as you've exchanged contracts. Ask the insurer for a certificate of currency--a document showing the details of your insurance, how much you're covered for, etc.. You'll need to provide this to your lender in a few steps' time. Have the seller (or their agent) provide a copy of the contract for sale to your solicitor. Once your solicitor has received this, meet with them to review the contract and ensure that everyone is satisfied. If buying through private treaty, you can sign the contract at this point and hand the deposit cheque to your solicitor. Arrange an inspection of the property. The point of this is to make sure you're happy with the condition of everything before committing to buy. If buying at auction, you'll get a chance for a final inspection before the auction starts. Otherwise, you'll make a time with the sellers to see the place. If buying by private treaty, you will meet your solicitor to sign the contract (if you haven't already), and the seller will do the same. Your solicitor receives a copy of the contract signed by the seller, and the seller's solicitor receives a copy of the contract signed by you. If buying at auction, the process is the same, except you and the seller will be signing on the spot, following the auction. You'll feel cool and confident because you've done your homework: reviewing the contract for sale and studying the building/inspection report. Notify your lender that your offer was accepted. They'll need a copy of the instructions for sale (provided by the seller), and will arrange a valuation of the property and (based on this) will advise how much they're willing to lend you. In some cases, you might also be charged mortgage insurance. This is a discretionary fee that your lender might charge you if you end up borrowing more than a certain percentage of the value of the property (typically, if your deposit is less than 20% of the property's value). Note that this insurance protects the lender, not you. To you it's just a fee. If buying at auction, this is probably the first moment you've had to celebrate. So do that! The agent will probably have given you (and the seller) a nice bottle of bubbly so you can still celebrate without spending any more money! Your solicitor will be in touch to request that you provide a cheque to cover stamp duty (they'll tell you how much it is). Another visit to your bank for this. Your lender will be in touch to finalise the details of your mortgage. This is where you sign your life away--they'll give you a huge stack of forms that need to be signed in about a hundred different places. You'll also need to provide evidence that you have insured the property, so send along your letter of currency your insurer sent you a few steps ago. At the time of writing, the Government is offering a First Home Owner's Grant (FHOG) for people buying their first home. If you're eligible for this, now is the time to apply. You can either apply yourself, or your finance provider can do it for you. If your finance provider does it for you, they receive the grant on your behalf and can add it to the pool of funds during settlement. Arrange a pre-settlement inspection of the property. This is your last chance to make sure everything has been left in a state that you're happy with and probably the first time you've seen the property completely empty. Just before settlement, contact your solicitor to find out if you need to provide any additional cheques. There will be some miscellaneous amounts (such as the cost of the pest report, any difference between the amount you borrowed and the agreed purchase price of the house, etc.) that you will need to cover in the form of bank cheques. Contact the seller's agent to make arrangements to take possession of the keys after settlement. If you're expecting someone to contact you, such as your lender or your solicitor and you haven't heard, follow it up! It's just possible they've missed something and you don't want to find out on the day of settlement because it's quite possible the settlement won't occur if something is missing and that could end up costing you quite a bit of money. Contact your solicitor to double-check that they are ready to go ahead with settlement. Wait anxiously to hear from your solicitor to confirm that settlement went through. If the reserve was met, and you're the highest bidder when the hammer falls, you just bought the place. After that, you've got a 4-12 week settlement period which gives you time to finalise your finance. If your finance falls through, the sellers get to keep your deposit (5-10% of the purchase price). That's bad. Of course that won't happen to you because you arranged pre-approval of finance before the auction for an amount at least as high as your winning bid. If your bid was the highest but the bidding didn't reach the seller's reserve, the house will be passed in. In that case, you have first option to negotiate with the seller after the auction. Many houses that are passed in at auction end up being sold this way so all is not lost. Buying at auction also means no cooling off period. In the ACT (and in NSW), buying by private treaty entitles you (and the seller) to change your mind and withdraw from the sale. You aren't legally entitled to claim the property until contracts are exchanged (even if you paid a small "holding deposit"). If you buy at auction you don't get this. On the flip side, the seller is within their rights to sell the property to someone else during the cooling off period if they get a better offer (known as gazumping), so buying at auction removes the risk of this. You get pre-approval from your lender to borrow some certain amount. This is just an indicator of how much they're willing to lend you given your financial circumstances; it's not a promise for anything. Imagine a friend drunkenly promising to lend you money--it's about that formal. You find a place you like, figure out how much you're willing to pay, and make an offer (either privately or at auction). Your offer gets accepted, you pay the deposit (10% of the accepted price, usually) and exchange contracts. At this point, your lender arranges a valuation of the property and figures out how much they're willing to lend you based on their valuation. That means that if the lender values the place you just agreed to buy at lower than you were expecting, you're not going to be able to get a loan for as much as your pre-approval. If you can't raise the difference and you bought at auction, you lose your deposit. Ouch. If you're buying at auction, you really need to have arranged finance up to a certain level in advance of the auction and make sure you do not exceed this value when you are bidding! You can get the property you're interested in valued before making an offer or going to auction. The story here seems to be that independent valuers generally won't differ by much, so paying the three to four hundred to get the place valued is a good investment. It's not ideal though: the lender's valuation might still come out differently from the one you arranged. The valuation a bank arranges is often less than the price you're paying or in the valuation you arranged privately because the bank is looking at the value of the house if they need to sell it quickly if it turns out you can't pay your mortgage (i.e. they "foreclose" on you and you lose the property). It would be nice to be able to have the property valued by the same firm that your lender will use, but you can't do that either: to help prevent collusion, lenders must use a rotation of valuers and won't know in advance which will be picked to perform the valuation. I'm still struck by the large number of people who need to be coordinated to see the whole property sale through, so it's little wonder that how smoothly it all goes is largely dependent on how well-organised everyone (including you) is. Vijay Gakhar from Aussie Home Loans is likely the most organised guy in the world, and has tirelessly answered my unrelenting questions. Lindsay Peak and the team at Ray Swift Moutrage & Associates have been great to deal with. They were reassuring and worked quickly on their parts of the process without being prompted. Jonathan Charles from Independent was employed as the agent of the seller, but took my interests to heart anyway. He gave clear guidance through the whole process and invited me to ring him any time of the day or night with questions. Many thanks to Jon R. for his extensive feedback and improvements to this article. Jon greatly helped to clarify the differences between buying at auction and buying at private treaty. All remaining errors are mine, however! Take some deep breaths. Everything will be OK! You'll do great!